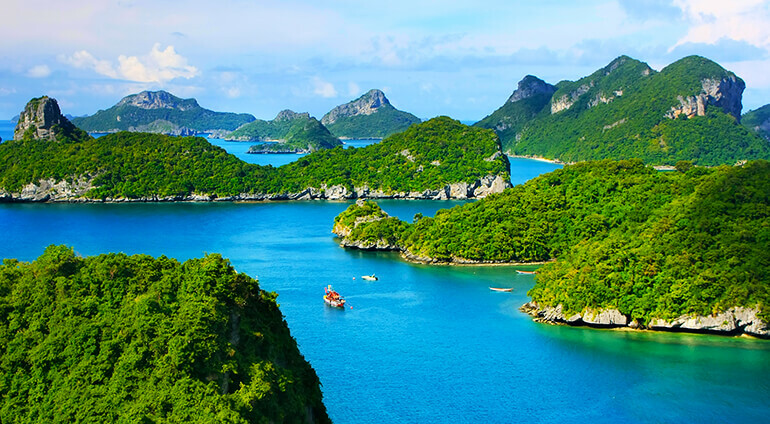 Other islands which are relatively close by in the Gulf of Thailand include Koh Tao and Koh Pha-Ngan. While smallest in size, Koh Tao is building in popularity, thanks in part to its easily accessible and diverse dive spots. Here you can swim with sharks and rays amidst the vividly bright coral and be back on dry land in time for sundowners. This luscious jungle topped paradise is also great for hiking and has beautiful white sand beaches, good nightlife and a laid back vibe. Best known for its wild Full Moon Parties at Haad Rin, you don’t have to be up for a big night out to appreciate the neighbouring island of Koh Pha-Ngan. In fact, away from peak party times, it can actually be quite a sleepy spot. Hat Thong Nai Pan Noi has the feel of a smaller scale Koh Samui, perfect for those looking for a resort that’s a little bit more off the beaten track.